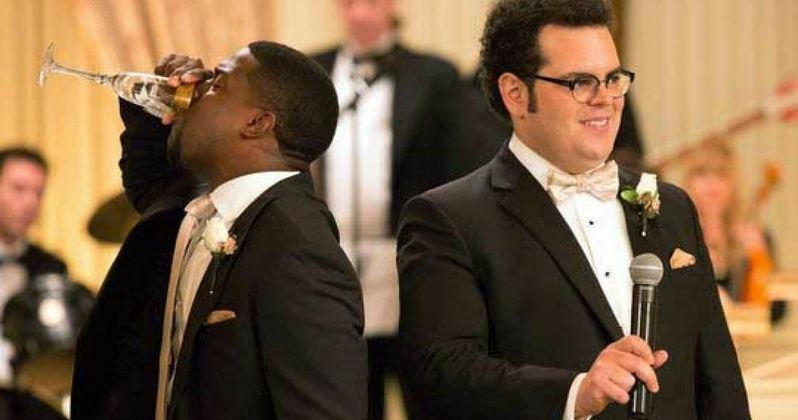 Kevin Hart and Josh Gad bust a move on the dance floor in the first three photos from The Wedding Ringer, before the first trailer debuts tomorrow, Thursday, June 19. Kevin Hart stars as Jimmy, a businessman who caters to men in need of a best man for their wedding. Josh Gad plays his new client Doug, a successful entrepreneur who not only needs a best man, but an entire team of groomsmen, as Jimmy tries to pull off his biggest job ever. Take a look at the new photos from director Jeremy Garelick's comedy, then read on for more details from both Kevin Hart and Josh Gad. Kevin Hart reveals that his new client Doug represents one of his biggest challenges, to try and make him look like one of the most amazing people in the world. "I run a business where I'm a great best man for the right price. But I do what has never been done before in this case. I make this guy look like one of the most amazing people in the world." Josh Gad reveals that he was so impressed with the concept, he thinks that a business like Jimmy's, dubbed Best Man Inc., could take off in real life. "Should this movie be successful, it's going to launch a very niche market that's going to explode. I know guys and girls who struggle to put together a killer wedding party. And if Kevin ever falls on hard times, which is possible, he could parlay his movie career into something even bigger." Kevin Hart revealed that the story is a modern-day bromance, while talking about the chemistry he had with Josh Gad. "This is one hell of a whirlwind. It's a modern-day bromance with two guys who feed off each other really well." Josh Gad also added that the pair make quite the dynamic duo on the big screen. "The two of us complement each other in a wild, dynamic way. What I lack in urban rhythms, Kevin makes up for. What Kevin lacks in Broadway legit rhythms, I certainly make up for. We make a dynamic duo."